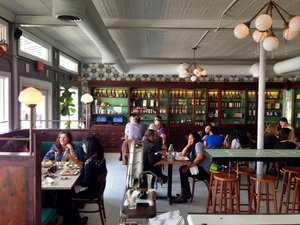 For those of you who haven’t been to Hillside Farmacy on the Eastside of Austin, Texas here are a few images of what I saw and ate during my first visit. Sitting tranquilly on a corner lot of a busy 11th Street corner this restaurant buzzes with constant activity. I was there right after a Friday lunch rush. This is the time between 1:30 and 4p when things settle down a bit, shifts change and preparation for dinner is just beginning behind the scenes. 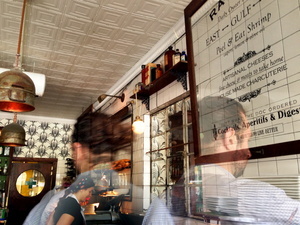 And that’s why I got to sit in a quiet little corner looking out and into a restaurant that was beginning to charm me. The concept is pharmacy-esque with old-school warm woods and a new-school hip color scheme that is pleasing to the eye; at least mine. One of the new trends I’ve noticed in restaurants is the absence of salt and pepper on the table; unless it’s a signature blend or a cool color. A primary and learned technique in culinary school is how to season with salt and pepper. The ideology is that if this is done correctly there is no need for seasoning (salt & pepper) on the table. That said, I like to have the choice and HF gives you that in the form of two cobalt blue bottles with definitive labels. Stepping into the restaurant you’re met with a professional staff and fun people watching. I had a the Fried Egg Sandwich with Bacon. And it was REAL GOOD! For a Friday afternoon jaunt to the Eastside of Austin it was well worth it. This first timer left with a happy belly and big smile. Thank you Hillside Farmacy. I’ll be back. p.s. Love the “farmacy girl” on the lavatory door. Put yourself behind the wheel and slowly drive down a slightly hidden road. All along the way bursts of red, orange, purple, blue, white and every shade of green almost blinds you angling your head side to side not wanting to miss one bit. These are the colors of petals, leaves, grass, butterflies and much more. What we natives call a Texas springtime. And there’s no other place you can see and experience it so prolifically other than a Texas State Park. And today, I did just that! 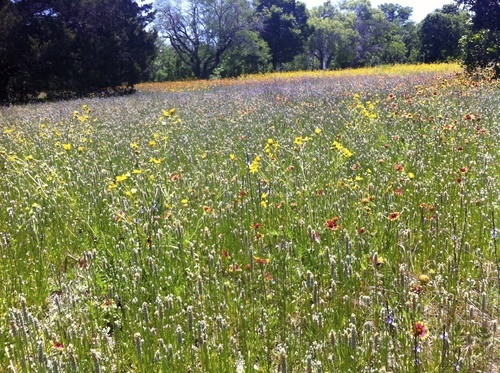 You see, Texas State Parks and Wildlife is looking to the month of May as their premier “Picnicking in the Park” month. To kick it off they hosted a wonderful luncheon at McKinney Falls State Park in Austin, TX. While I’ve been to several state parks over the years this one was new to me. It was the perfect setting for our civilized indoor/outdoor picnic. Cecilia Nasti, Producer & Host of Passport to Texas radio series (and KUT’s Field & Feast) asked several food bloggers from the Austin Food Blogger Alliance and others to provide recipes and or food for the event. Each recipe is one that is simple and can be made specifically for a picnic. As you can see we had a veritable feast! Check out the recipe I made Sugar Snap Peas w/ Basil; an especially great side dish for grilled meats. To my suprise, after lunch and a meandering walk through the color-raging wildflowers, I was met in the parking lot by new friends. They wanted me to have a left-over, just harvested watermelon from the Texas valley. How could I refuse? I didn’t. Thank you to the folks at GO TEXAN! So, now it’s your turn. Pull the the family together, make a simple picnic, put yourself behind that wheel, drive to the nearest Texas State Park and enjoy your day. Texas State Parks rock! Peaches and blueberries! It’s summertime here in Texas and the peaches are divine. (thank you springtime rains). So what do you do with those little peaches? First, take a short trip to the hill country and buy as many as you can from the local farm stand. Then, grab one of those softly fuzzy little orbs, put it up to your mouth and BITE down. Experience the warm lush sweet nectar of the peach. And don’t be surprised if it’s juices run down your chin and into your hand. It’s just the best! With sticky hands, drive yourself to the market and pick up some blueberries and citrus; then get yourself home. Take out a few of your pantry staples (see below) and prepare yourself to bake one of the most fantastic rustic pies you’ve ever had! Ok, I’m getting a little bossy but I just can’t help myself. This recipe is one of my absolute favorites. It couldn’t be easier and it’s the perfect dessert for your summertime entertaining. Enjoy! Thaw one roll of Pillsbury dough. Place parchment paper on a ½ sheet pan. Sprinkle ½ tsp of flour in the center of the parchment paper (same circumference of the dough – as close as possible). Roll dough out on the floured parchment paper. Place in refrigerator to keep cool. Meanwhile, in a large non-reactive bowl, gently and thoroughly mix the peaches, blueberries, sugar, ½ tsp flour, salt, ginger, cinnamon, and lemon juice. The juices of the fruit will begin to macerate and the mixture will thicken. Set this aside and remove the dough from the fridge. Let the dough stand at room temperature until it is pliable. Take the fruit mixture and place it in the center of the dough; leaving a 1-2” lip around the circumference of the dough. It will look like a pile of fruit. Gently fold the edges of the dough over the pile of fruit (like you would a pie crust). The dough will not meet in the center and you don’t want it to. It should only encase the fruit as far as it can go. You will have a medium circle of fruit showing. Make sure the dough is folded securely. Combine egg and water in a small bowl. With a pastry brush, gently brush egg wash over the entire dough portion of the galette. Generously sprinkle sugar over the egg washed dough. Place in the pre-heated oven for 20 to 30minutes or until the dough is golden and the fruit is bubbling. *It’s always great to make your own tart dough. But let’s face it sometimes time is an issue. Therefore, a store-bought dough is just fine. I used Pillsbury because I think it is one of the best and most easily accessible doughs in the market. It just works! Oh the blessing’s of a Texas summer!! Thanks to my fab neighbors & a very wet spring, there were piles upon piles of sweet baby peaches to be had; right here in my hill country hood. These luscious tarts were made for a Chardonnay tasting I catered last week. The recipe seems lengthy but is really quite simple just a few steps; plus you can buy your tart shells at your local gourmet market. Yip! 3 medium size peaches, halved/pitted 1tsp white or brown sugar ½ tsp salt 1tsp extra virgin olive oil for the honey cream 2 8-ounces cream cheese, room temperature 6 ounces of golden honey Pinch of salt (optional) 1 package small to medium tart shells (a package of 12 works great for size) ½ jar of peach preserve peach prep. Place prepped peaches into a medium size bowl. Drizzle olive oil over the peaches and mix so that the oil surrounds the peach halves entirely. Evenly sprinkle salt and sugar over peach halves. Heat a grill pan to high. Place peaches flesh side down, turn heat down to medium and cook until flesh becomes somewhat soft; about 2 minutes. Turn peaches over and cook until just soft. Peaches should be slightly charred and soft to touch but not falling apart. Take off heat and set aside on a sheet pan or tray. Cool completely. Once cool, slice the peach ½’s into ¼’s then 1/8’s then 1/16’s. These slices should be pliable but not falling apart. Set aside. Place cream cheese in a mixing bowl and mix on medium with a paddle implement until smooth. Add honey while continuing to mix. Stop mixing and scrape down bowl. Continue to mix until all honey has been poured. Scrape down sides and place in a container that has an airtight seal. Set aside. tart shell prep Unwrap tart shells and line them up. Place up to 2 TBSP of honey cream into each shell. Spread honey cream evenly inside the shell with an offset spatula. putting tart together Place peach slices on top of the cream beginning from the inside outer edge of the tart circle. Continue this process working from the outer edge in – overlapping the peach slices slightly until you come to the center. Take a small piece of peach or cut a small piece and fill in the center. It will eventually look like a peach rose. Set aside. glaze prep In a non-reactive saucepan, over low-heat, heat peach marmalade until just soft. Take off heat. With a wide brush – pastry brush, dip in marmalade, brush off excess on side of pan and gently brush over the peaches on each tart. Cool completely. Cover tightly and refrigerate tarts until needed. Take out up to an hour before serving and bring to room temperature. Serve as is or with freshly whipped cream topping…maybe a little fresh mint from the garden. Eat with pleasure. Serves 8-12. Summer in Austin, TX — Beat the Heat, Baby! I have visions of traveling food friends snug and bundled in warm scarves, coats, turtlenecks and wool pants. It snowed in Montreal, remember? This blog entry is dedicated to all my friends and colleagues coming to Austin, TX for the annual conference of the International Association of Culinary Professionals…in June. You’re coming to Texas! And when I heard we were having our annual IACP conference here in Austin, I gave a little whoop and holler. Then I saw the June date and said aloud, “Wowza! It’s a bonus!”. Not only are we hosting you in our dear city, we’re treating you to the beginning of a grand old Texas summer. You lucky devils you! Yesterday, May 23, 2011, I got into my car at 6:45pm. It was 104°. So, from me to you here are 5 things to keep you comfortable, content and full of vigor. All the while, keeping you alert in your seminars and in the mood to celebrate our fabulous city. Keep the water flowing. Have a bottle with you as you walk about, take a tour and in your seminars. I would highly recommend keeping a few water bottles in your hotel room. Our tap water is just fine but it’s always great to have a cool bottle of water waiting for you. * Fill you ice bucket with ice in the morning while getting ready. Push your water bottle into the ice and leave for the morning or day. It will be wet and the label will surely come off. However, it will be well worth having that cool, crisp and refreshing liquid flowing down your throat. * Another is to take a wash cloth, roll it up and stick it in the ice along with the water bottle. When you return to your room, gently pull it out of the “ice-water”, wring out, wipe your face and wrap around your neck. It’s going to feel so good! Dress comfortably with staying cool in mind. Think fabrics & footwear that breathe like cotton, linen and open toe shoes. Certainly you want to bring a light jacket and/or sweater to have for your seminars (it might just be cool at the convention center). However, if you are touring or walking about town you definitely want to consider lightweight & light colored clothing. I know black is a favored color for travel (it’s mine for sure) , however, with that sweet Texas sun shining down plus added moisture it makes us hotter and sweat more! Who am I kidding; I’ll definitely being wearing something black-sleeveless and swirly preferably. Eat & drink moderately and with passion. How dare I presume to tell a food friend how to eat and drink? I know. But I’m going to do it anyway. Don’t forget sunscreen, sunglasses, hats and umbrellas. Sunscreen-Super important no matter if you are in a car, bus or walking about town. Wear it to protect your skin. The humidity of course will be your friend helping keep your face dewy! That’s exciting, right? Hats & Umbrellas – I wanted to include this especially for those of you going to the Capitol and are touring. If it’s your first exposure to the sun this season a good wide brim hat or baseball cap will definitely protect top of the head and face. An umbrella will give you greater protection. The Hilton pool is going to start looking pretty good after a day or two. Or any hotel pool where you might be staying. You might even have an Austin food friend with a pool. Don’t be shy. Hitting that cool water (even though it might be kinda warmish now) after a long day of travel, walking, tours, eating, drinking, and talking is going feel really great-no matter the water temperature. With all this said, we may have rain or it could be overcast. We might still have a Spring-like “cold” front come through which will lower the temperature to the 80’s. Yes, that’s cool in Austin. So, with cool visions and a few ideas to implement in reality, I personally welcome you with open sunscreen drenched arms, a healthy dewy face and all the warm wishes a native Texan and Austinite can give. Keep cool, learn lots and enjoy yourself!